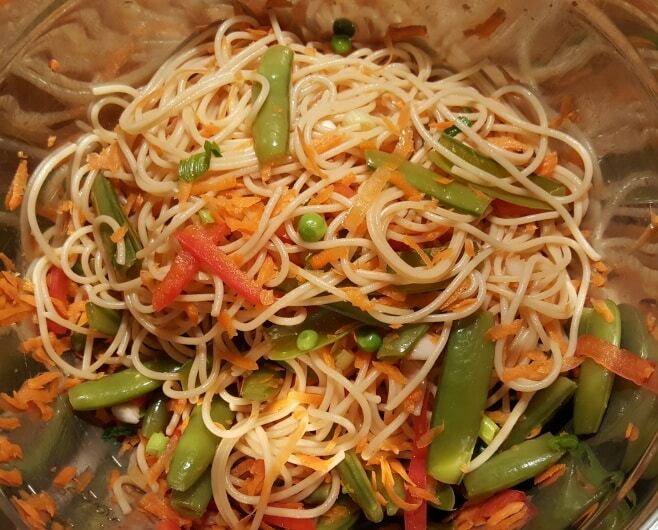 Asian Crunchy Noodle Salad is a cold salad made with crisp snap peas, carrots, peppers and a peanut butter dressing. Pressure Cooker or Stove Top. 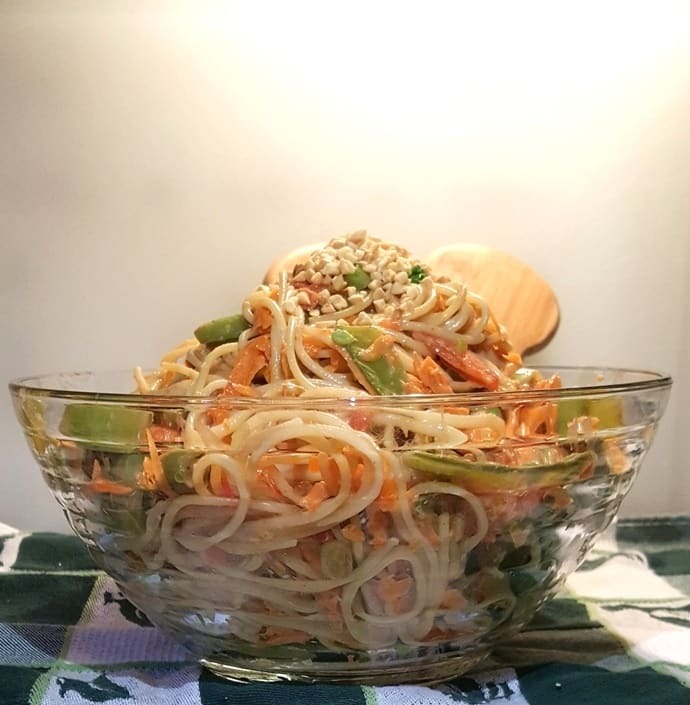 I’m really not one for cold pasta salads, but this Asian Crunchy Noodle Salad I quite enjoy since there is peanut butter involved and I like everything where peanut butter (that has not been cooked) is involved. I could eat peanut butter just out of the jar with a spoon, nothing more. It is just a matter of boiling some water and cutting up some vegetables. 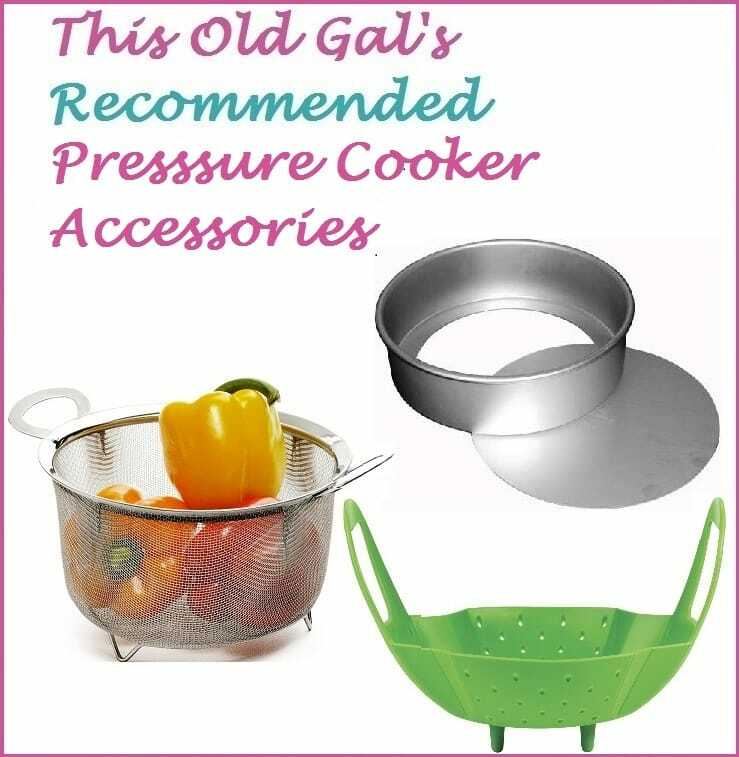 If you have a Pressure Cooker, it’s even easier! Inspired by Ina Garten and with my changes, I now love this salad. 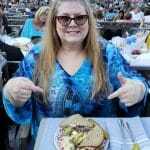 I prefer smooth peanut butter and my husband prefers crunchy peanut butter in a peanut butter and jelly sandwich. If you like other vegetables, go a head and add them. If you prefer green pepper over red, or prefer orange or yellow pepper, it will all work. 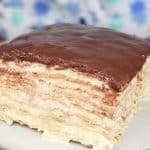 Water chestnuts would be great too and add more crunch! Bean sprouts are a fabulous addition. Brand of pasta does make a difference, so if you have not tried De Cecco brand, you are missing out. 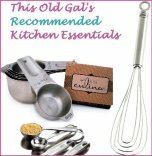 We can usually get De Cecco Thin Spaghetti locally, but if not, trusty Amazon is just a click away. Besides, their prices are better on De Cecco Pasta and we like to purchase different shapes for other dishes. 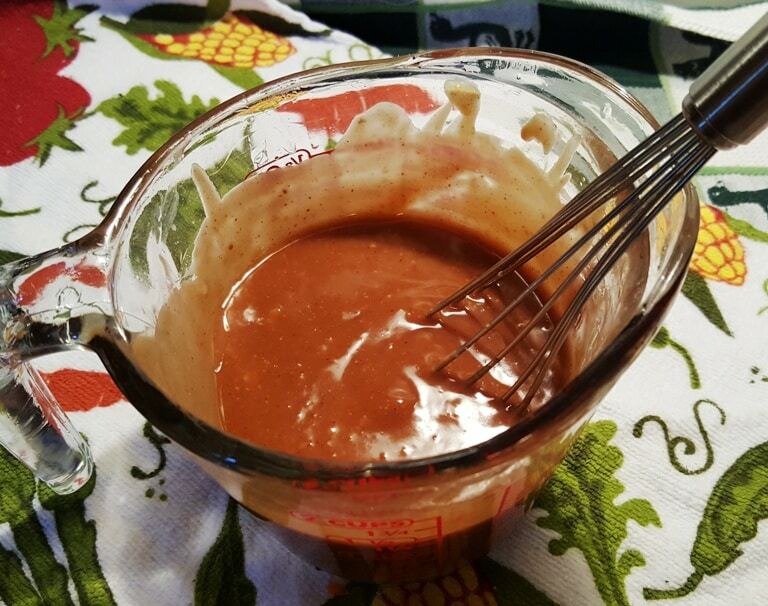 Mix up all of the liquid sauce ingredients and whisk together well. 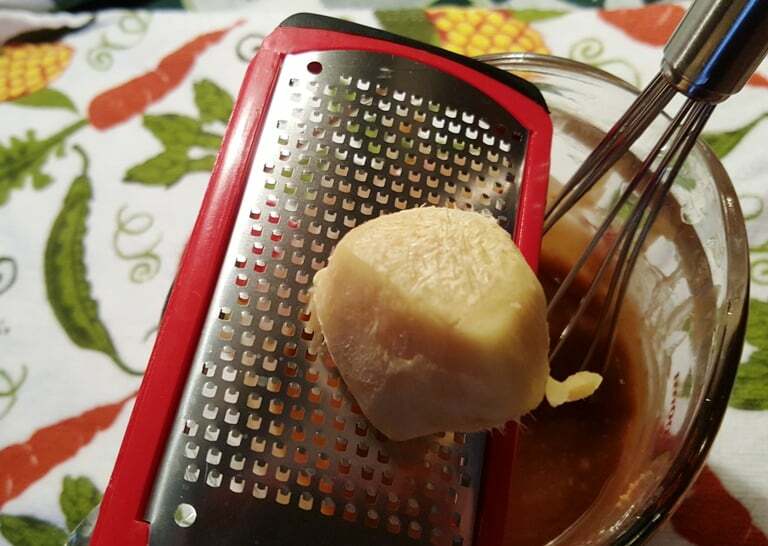 I love to use a cheese grater to grate ginger and garlic so that I don’t get mouthfuls of one or the other and a little goes a long way. 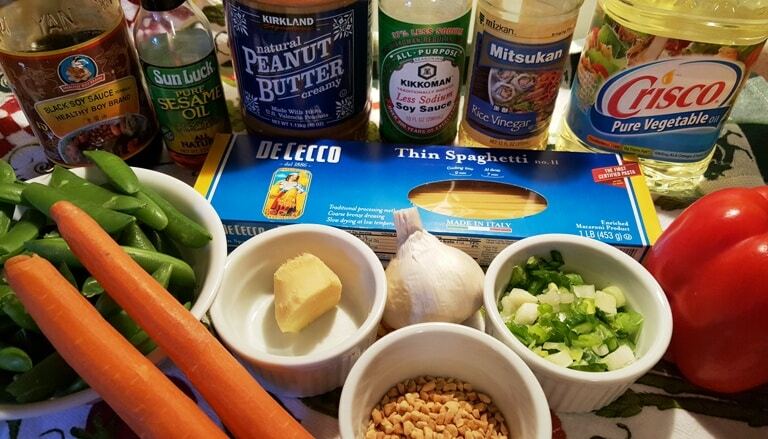 Whisk the dressing together for the Asian Crunchy Noodle Salad and then put the sauce in the refrigerator to chill. Cook the Thin Spaghetti according to the package directions. If using an Instant Pot or Pressure Cooker, use 4 cups of water and cook for 4 minutes only. 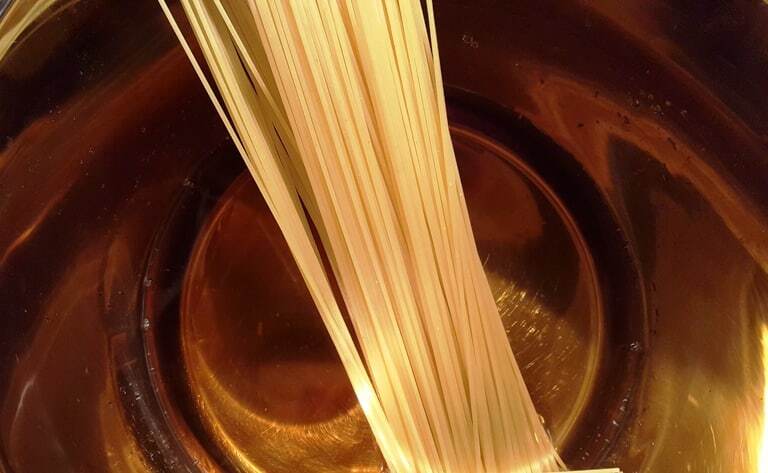 When the pasta is ready, pull it out of the hot water and strain it under cold water to stop the cooking. 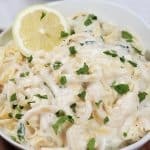 Place the pasta into a large mixing bowl. Place the sugar snap peas into the steamer basket and put the basket into the hot water or Pressure Cooker, just to blanche a little. 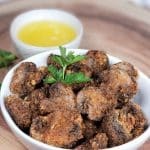 The sugar snap peas should remain crisp, so make sure not to over cook. 1-2 minutes in the hot water will do. Pull out the steamer basket of sugar snap peas and run under cold water, shake and then add the snap peas to the large mixing bowl full of pasta. Add the carrots, bean sprouts, pepper and scallions and mix through. Pour on the dressing and toss. Place the Asian Crunchy Noodle Salad into a fancy serving bowl and garnish with Cilantro (if you like it) and chopped almonds or peanuts. Serve cold. 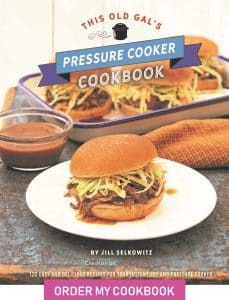 If using a Pressure Cooker, add 4 cups of water and cook for 4 minutes at High Pressure and then do a Quick Release. 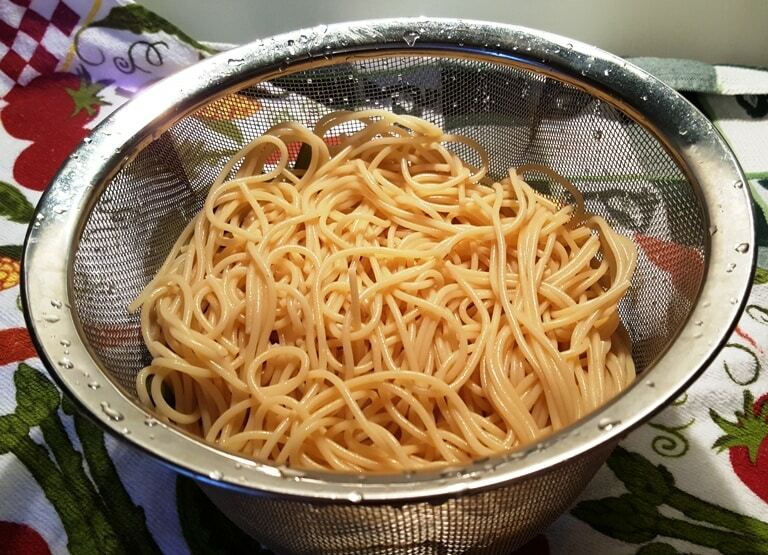 Rinse cooked spaghetti under cold water and then place in a larger mixing bowl. Place sugar snap peas into hot water and blanche for 1-2 minutes. Remove from hot water and run under cold water. Drain and add to large mixing bowl with spaghetti. Add all vegetables to large mixing bowl. 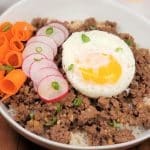 Mix up sauce ingredients and pour into serving bowl. 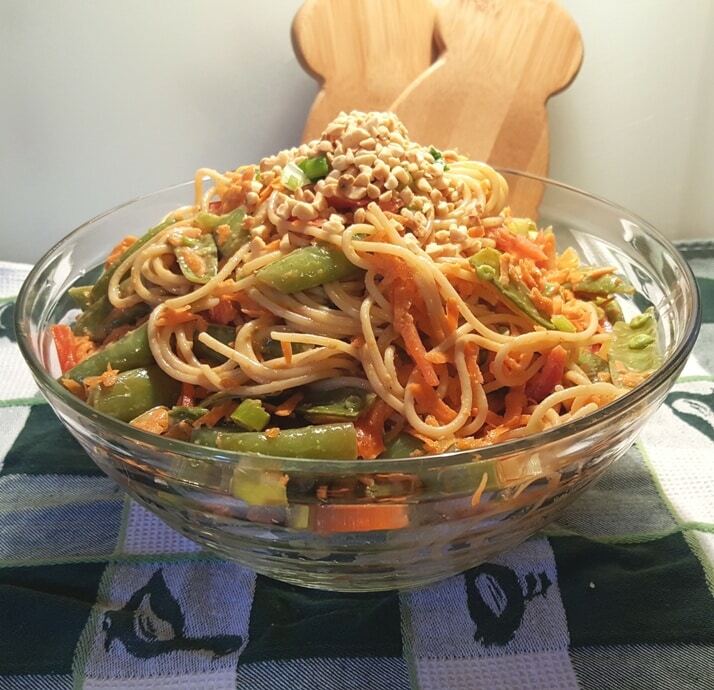 PIN this Asian Crunchy Noodle Salad with Peanut Butter Dressing!